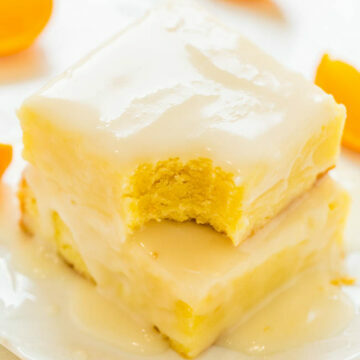 Orange Lemon Orangies – Like brownies, but made with orange, lemon, and white chocolate!! 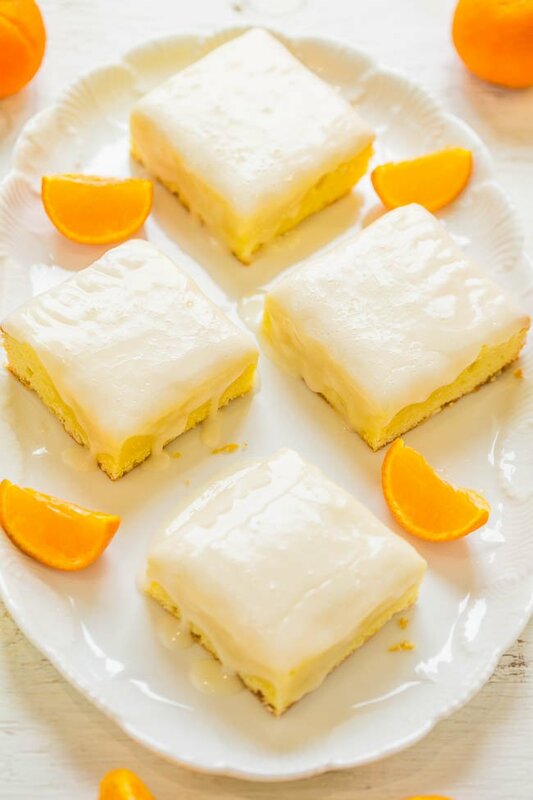 Fast, EASY, dense, chewy, and packed with big, BOLD citrus flavor!! If you like lemon bars and citrusy desserts in general, these fast, easy, one-bowl, no-mixer bars are just the thing for you. 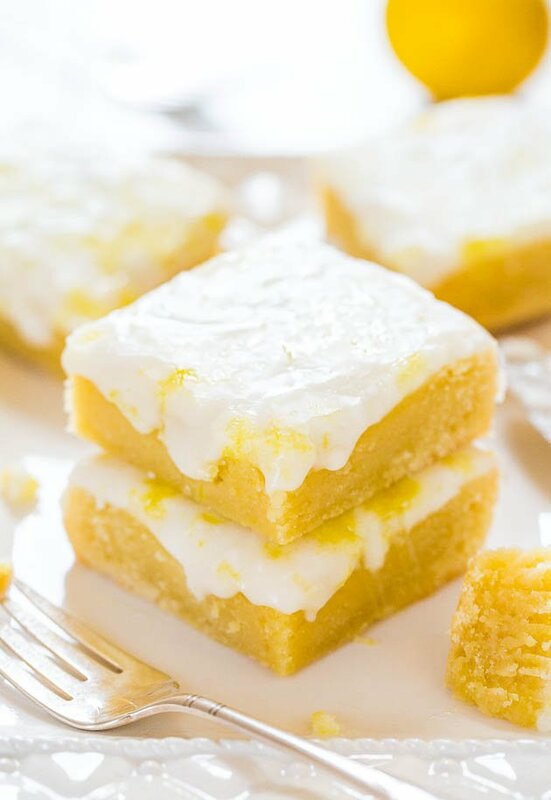 They’re dense and chewy and if you’re looking for traditional lemon bars or fluffy lemon cake, this recipe isn’t that. It came to be because I adapted a very popular recipe for Lemon Lemonies and created Orangies so to speak. So many readers have asked me on the Lemon Lemonies recipe if it can be made with an orange twist and I decided to give that a whirl. I used orange extract and orange juice in the white chocolate-based batter so the bars are the orange half. The glaze is made with lemon juice which is obviously tarter and a nice balance to the sweeter orange base. 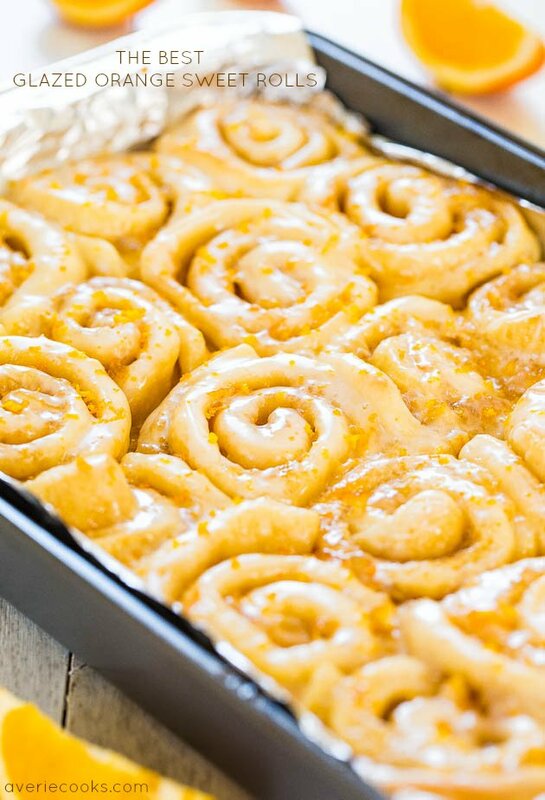 I felt that using orange in the glaze could cause them to read too sweet but if that’s not a problem for you and you really want bold orange flavor, make the glaze with OJ. Bars – To a large, microwave-safe bowl add the white chocolate, butter, and heat to melt, about 1 minute on high power. Stop to check and stir and then heat in 20-second bursts, stopping to stir after each burst, until mixture can be stirred smooth. White chocolate is very prone to scorching and seizing up, so watch it carefully and don’t overheat. Wait momentarily before adding the eggs so you don’t scramble them. Add the eggs, granulated sugar, orange juice, orange extract, and whisk until combined. Bake for about 25 to 27 minutes, or until a toothpick inserted in the center comes out mostly clean, or with a few moist crumbs, but no batter; set aside and make the glaze. Glaze – In a medium bowl, add 2 cup confectioners’ sugar, 1/3 cup lemon juice, and whisk until smooth. As necessary, add additional lemon juice (or sugar) to reach desired glaze consistency. I used slightly over 1/3 cup lemon juice. Glaze should be fairly thin and easily pourable. Evenly pour glaze over bars, smoothing it lightly with a spatula if necessary, but glaze will likely just slide into place. Evenly sprinkle with lemon zest. Lemon Lemonies – Like brownies, but made with lemon and white chocolate! Dense, chewy, not cakey and packed with big, bold lemon flavor! 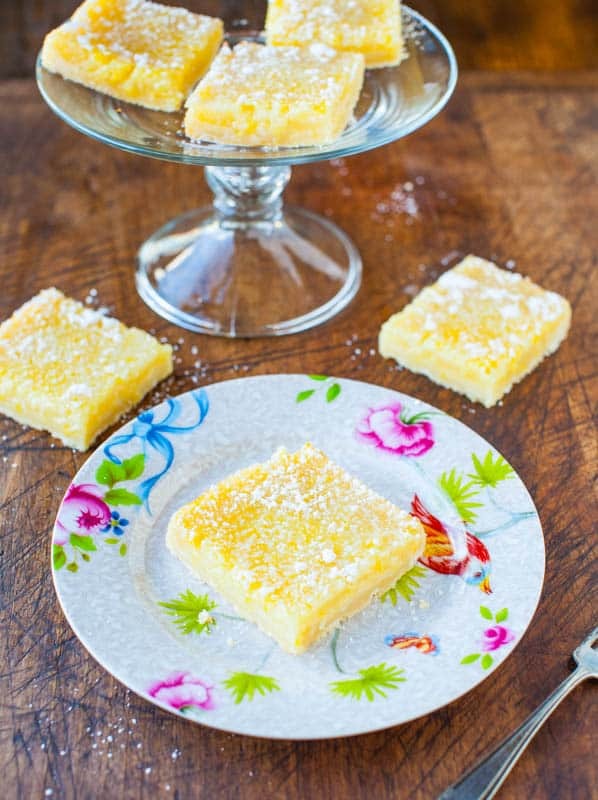 The Best Lemon Bars – Truly the best traditional lemon bars I’ve ever had! Orange Poke Cake with Honey-Orange Glaze – Bold orange flavor in this easy, 100% scratch, no mixer poke cake! 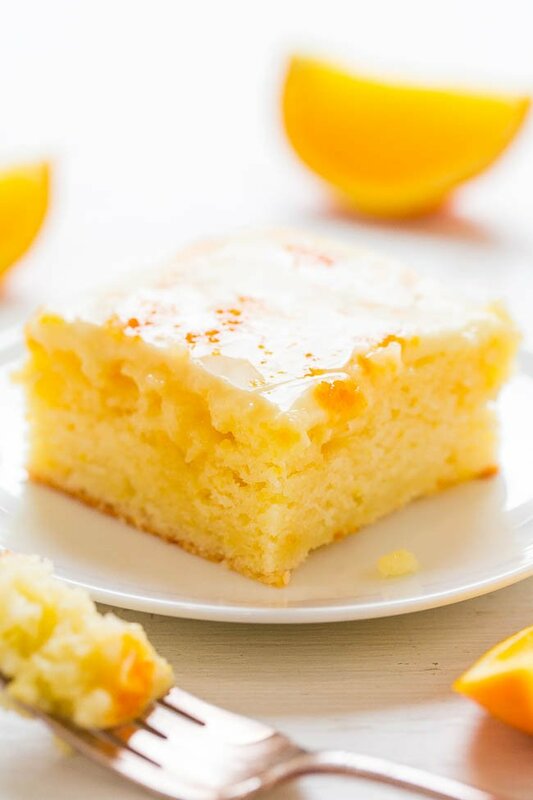 Orange juice, orange extract, and orange zest make this cake the best way ever to get your Vitamin C!! 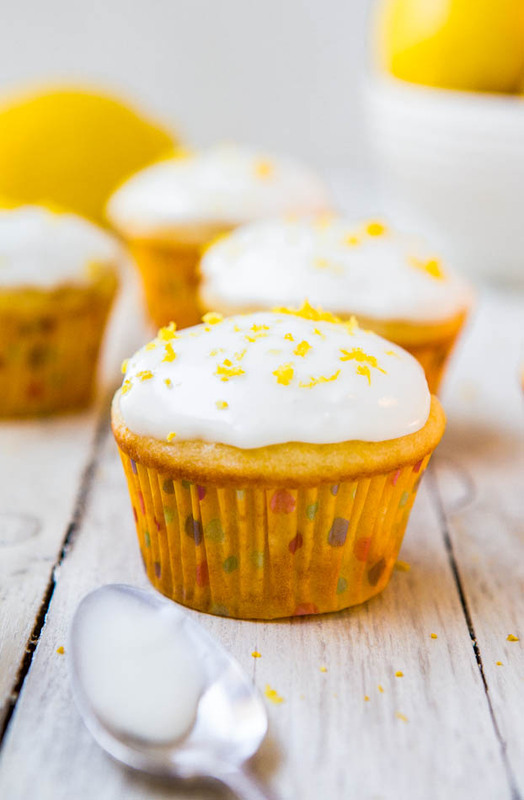 Lemon Cupcakes with Lemon Cream Cheese Frosting – Soft, fluffy, moist, very lemony cupcakes from scratch! Easy one-bowl, no-mixer recipe for cupcakes that taste like they’re from a bakery! 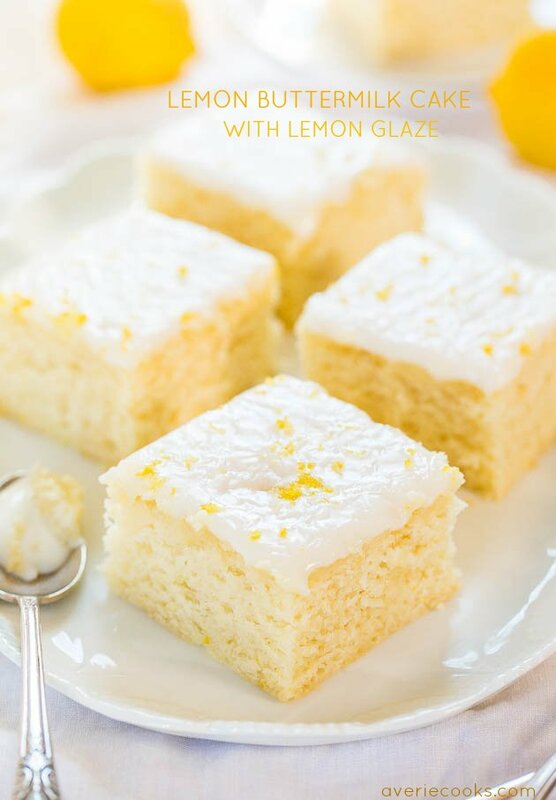 Lemon Buttermilk Cake with Lemon Glaze – An easy little cake with big lemon flavor! Soft, fluffy, and foolproof if you like puckering up! Orange Poke Cake with Honey-Orange Glaze – Bold orange flavor in this easy, 100% scratch, no mixer poke cake! Orange juice, orange extract, and orange zest make this cake the best way ever to get your Vitamin C! 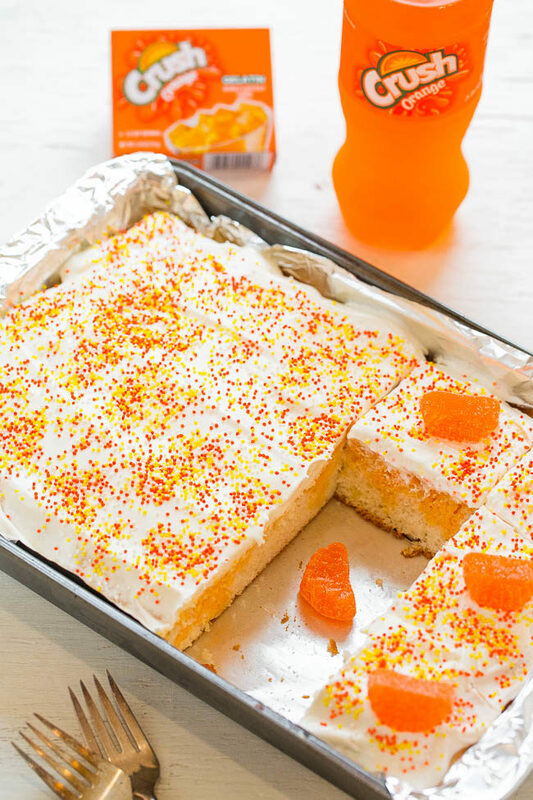 Orange Crush Poke Cake – Bold Orange Crush flavor in this easy cake that’s super moist and light! The kid in all of us will love this orange tie-dyed cake! Citrus desserts always seem nice right about now when we still have blah winter days. These look like a delicious twist on your lemon lemonies–I remember those! The lemonies have continued to stay popular over the years, glad you remember them! And yes, citrus desserts are great for the winter blah days! These are absolutely calling my name! I love orange flavored desserts! What a yummy idea!! I need to make these!! Nothing like a blast of citrus to brighten up the winter days! That looks great! Thanks so much! Enjoy the long weekend! 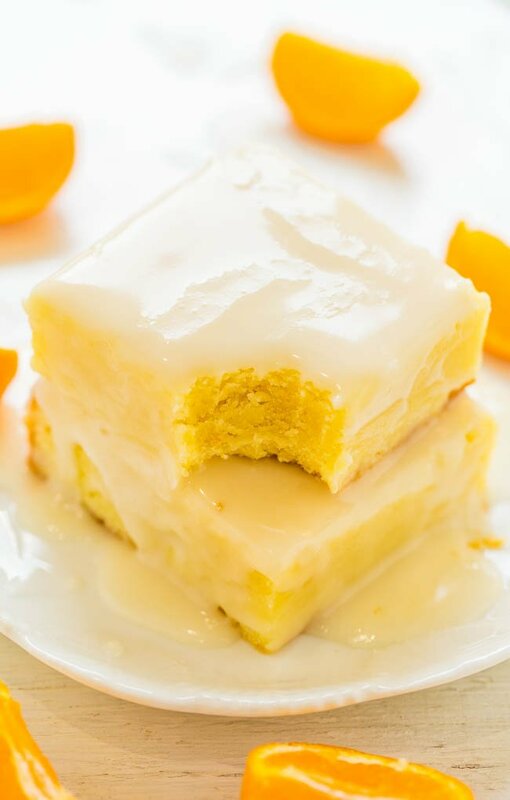 Lemon bar lover here so I am adoring this recipe with all its orangey goodness! Yes me too! I wish I still had some left! I would say no, it’s not going to be the right texture. Passion fruit sounds lovely! I bet they will be delicious! Glad you enjoyed this batch, too! We have a fantastic baker in our office and I requested these for my birthday dessert. They were amazing! So good that they didn’t even make it until noon!! Great recipe!